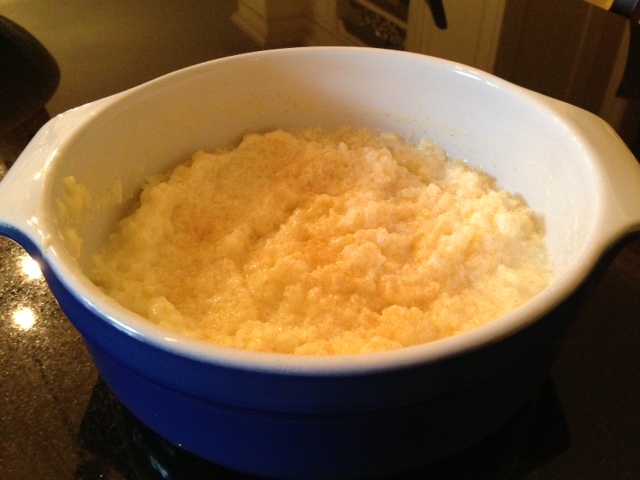 I LOVE Rice pudding…but all that Cream and Starch! I modified my favourite recipe and took a chance on NOT using anything other than Skim milk. Results were amazing. Creamy and delicious – This picture was taken after half the batch was eaten. 1: Pour 6 c. milk into med sized pot and bring to a boil over Med. Heat. Stir in Rice and return to a boil over Med heat. Reduce heat and simmer, uncovered for about 30-40 minutes. 2: In a small bowl, mix together 1 c. milk, sugar, egg yolks & vanilla. When Rice is tender, add to rice in pot. Heat to boiling point and stir frequently. 3: After about 20 minutes the mixture will thicken. Pour into a serving dish and leave on top of stove. It will naturally thicken a bit more. Serve warm with raisins or I like to sprinkle with cinnamon and brown sugar.